Blas Avocado A Flower type Dry weight 21.13% Maturity period 3rd week in June 25 to first week in August. "Perhaps it will be the ‘Blas’ itself whose distinctive fruit quality inspires a new generation of avocado pilgrims". Please read more about Blas in the The Vaughn-Jordan Project: of The Fairchild Tropical Garden. I got some bud-wood in early 2012 and top-worked a tree in January 24, 2012 if it takes, we'll get to see and taste it. I will do periodic updates on this tree and fruit. Pictures as soon as there is anything to take a picture of. March 3 2012, out of tree grafts I put on this tree two took and are doing very well. See Pic on left. January 22, 2014: Had an opportunity to update the pictures on this tree. This tree is looking regal. Impressive, 22 months post top working. Nice shape and is ready to bloom. Some areas the inflorescence is expanding and should have flowers in days. Certainly hope we can taste the fruit. this year. Seems like its flowering ahead of last year. February 5, 2014: The tree has opened quite a few flowers in one area, is other will open in a few days. Confirmed it is an A Flower type. February 27,2014: The Blas Avocado is in full bloom. Seems to be setting fruit. I saw quite a few. It should it is surrounded a a lot of B trees. March 24, 2014: Beginning to see some fruit the size of a dime. Not a lot but quite a few and growing fast. We should see fruit from this tree this year. May 24, 2014: The fruit is getting larger some now in the 3 " size. No fruit drop. Looks different. Probably more than 25 fruits. No pilgrims so far. June 9, 2014: Fruit is looking very nice and growing very well. June 21, 2014: I tagged two fruits to track the growth for the next couple of weeks. No 1 3 1/16 X 5 10/16 and No. 2 3 1/16 X 6 1/4. June 25, 2014: No 1, 3 3/16 X 5/13/16 and No 2, 3 4/16 X 6 1/4 Really growing in 4 days. July 4, 2014: The fruit picked in June 27, matured well. I think that it needs more time. Tested excellent just like a Catalina in July, creamy and delicious. Extraordinary for an early variety. It had a bid seed, probably because it was picked too early. I removed 4-5 more fruit today to see how the mature. July 11, 2014 Fruit no 2 was much larger and better. A very peculiar and pointy seed Excellent flavor for an early variety. Creamy , no fibers, good aroma and texture and it can stay in the refrigerator over night without turning brown. This is like tasting Catalina in early July. This has to be one of the finest avocado growing in So. Florida. This was picked in July 4, I would venture to say these will get better. during the next 2-3 weeks. July 16, 2014: Much to my surprise the fruits on this tree are beginning to change color to a darker not sure if purple or black. Clear indication of maturity, plus some fruit is dropping. See today picture for the color change. I ate one last night, my third or fourth. 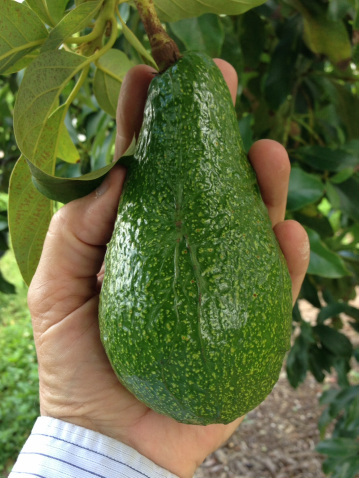 I can say is one of the best avocados I have grown, simply tasty and creamy, good all-around flavor. The maturity range for this fruit would start in July 5 let’s see how the fruit drop continues. The fruit size ranges 15-20 oz. the good thing about it is that the beginning of the color change gives the indication that is ready. This tree is an excellent early variety for the home. July 18. 2014: There continues to be fruit drop. I would like to revise the maturity period from July 1 on. The tree seems to have a short period or window before they can be picked. July 27, 2014: This avocado continues to surprise. Excellent quality for an early fruit. I did a dry weight test and it came in at a respectable 21.13%. This is one of the best early fruits I have tasted. Produces well, it has its short comings, like small maturity period, fruit is dropping right now, it ripens 4-5 days after is removed from the tree. The flavor makes up for them. If Florida growers could sell avocados like this all the time, the "watery" adjective will disappear from the Florida avocado jargon. More on dry weight. August 7, 2014: Picked 5 fruit from the tree. A lot on the ground. This should be the end of the picking for Blas. May 30, 2015: This tree is compact in size. This year only set 2-3 fruit. Seems like a definite alternate bearer. The fruits are small compared with last year. August 8, 2015: There were more fruit probably 8-10. Not a lot for a tree this size. Had one with dinner last night. Really good. Because of the alternate bearing, large seed and fast ripening once is remove form the tree this variety has no commercial value. May be for some homeowners with a lot of room.